Today's card was inspired by the Freshly Made sketch. Super easy! Thanks for stopping by and have a super day! Fun card and sounds like a fun weekend! Such a great card! 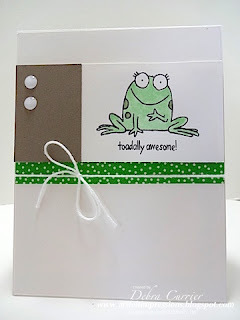 I love that frog (or toad!)! So fun! Great colouring! Love all of that white space! Thanks for joining us this week at Freshly Made Sketches!